The Russian daredevil, only known as Sanya, was filmed being set alight before diving off a five-storey building on to a huge pile of snow. 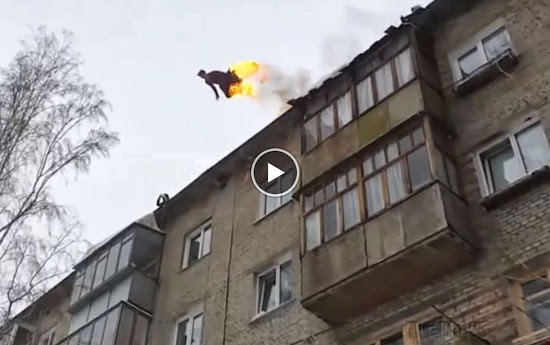 We’re not quite sure what the point of the dangerous stunt is, but it could be the result of a lack of youth clubs in the city of Barnaul, Siberia. Police warned him his ‘thoughtless and hasty actions’ could cause ‘grave traumas’. A video, featuring footage shot from several different angles, has racked up thousands of hits online.